Click on a number below to learn more about your bill. Tap on a section below to learn more about your bill. A unique account number that has been assigned to you by Amigo Energy. The address Amigo Energy has on record for all correspondence mailed to you. 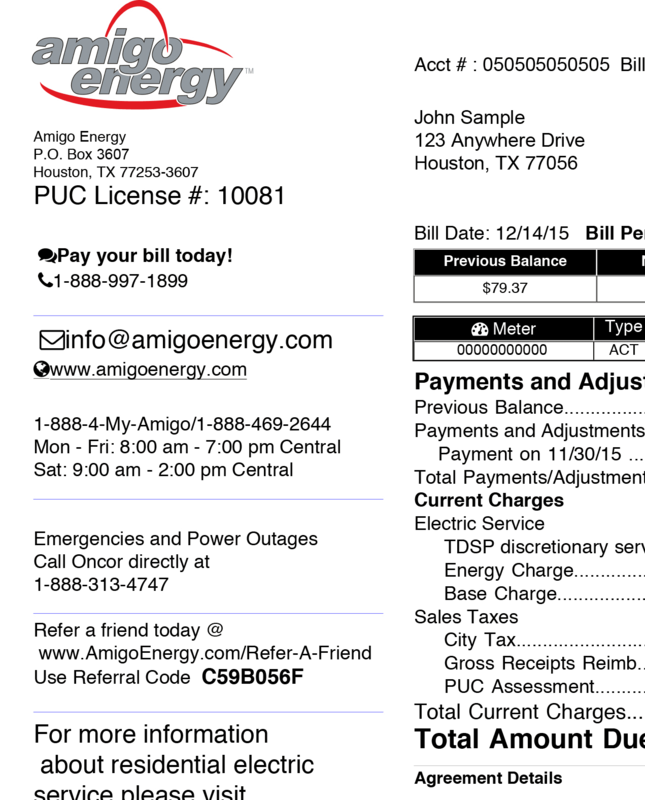 Amigo Energy’s physical address, customer service phone number, email address, and Public Utility Commission of Texas (PUCT) license number. Previous Balance - any amount unpaid from previous bill. 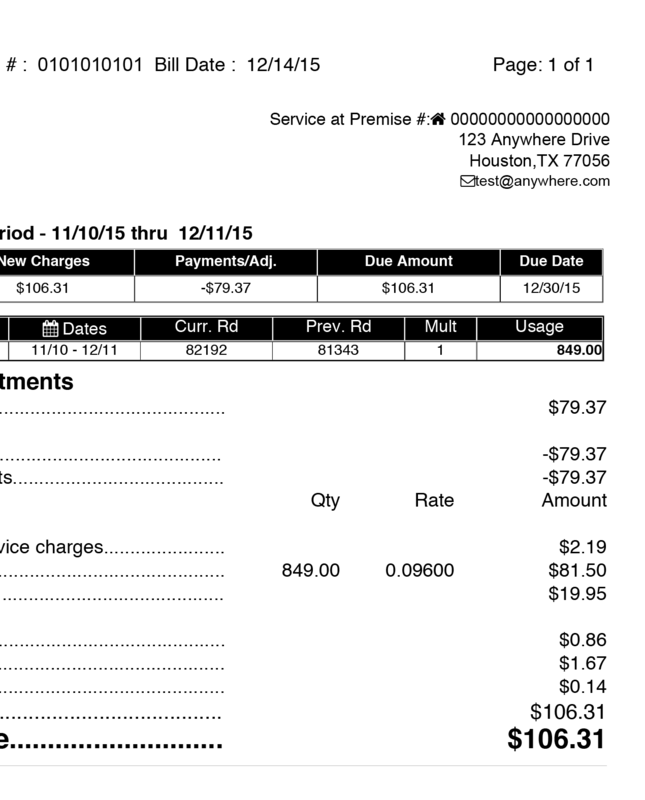 New Charges - sum of all electric service charges and sales taxes for current Bill Period. 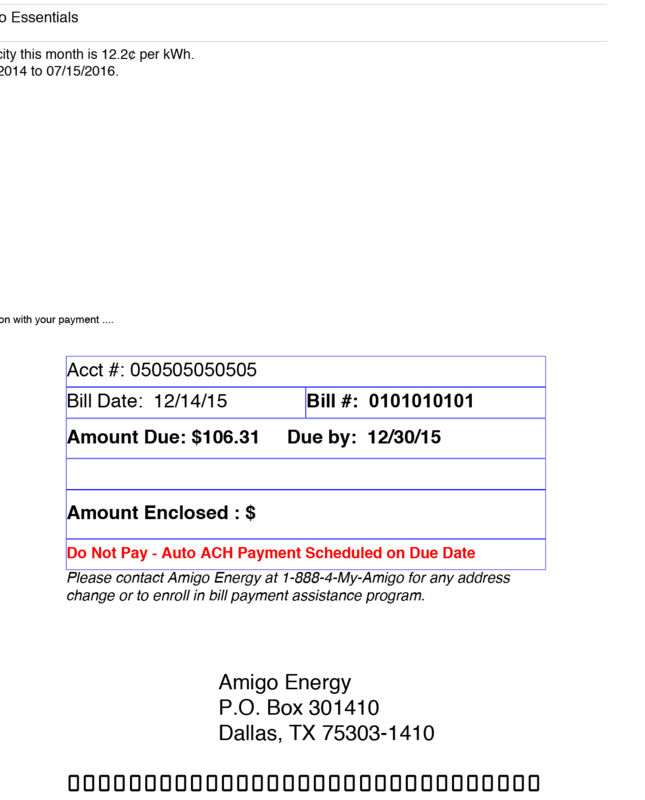 Payments/Adjustments - any payments or adjustments received by Amigo Energy since the previous bill. Due Amount - total amount due by Due Date to avoid Late Payment Penalty. Due Date - the date by which your payment is due for this Bill Period. Meter - the unique number that identifies the Service Address meter. Type - indicates whether your bill is based on an actual or an estimated usage. Note: in the event your bill is based on a usage estimate by your Transmission and Distribution Service Provider (TDSP) you will see “Est” in this section. Date - reflecting the current Billing Period. Curr. Rd. - the current numerical read on your meter by your TDSP. Prev. Rd. - the numerical read on your meter from the previous reading by your TDSP. Mult - the multiplier used to calculate your bill. Usage - the amount of energy in kilowatt hours (kWh) consumed during the Billing Cycle. The amount of energy consumed, multiplied by your contracted all-in rate (includes charges assessed by your TDSP). Sales Tax collected by authorized taxing authorities, such as state, cities, and special purpose districts. The amount you are required to pay by the Due Date to avoid a Late Payment Penalty. A unique identifier specific to the billing statement for the month in which this bill was generated. The unique number that identifies your electric service location. This is not the same as your account number. The address to which electricity is being supplied. The dates in which you were supplied electricity and for which this bill was generated. The electricity plan you are currently receiving service under, the average price you pay for electricity the billing cycle, and the contract expiration date. A graph showing your historical monthly usage patterns for up to 13 months. An opportunity to assist other Amigo Energy customers with their electricity bill. This program is mandated and monitored by the PUCT. A charged assessed for late payments in accordance with the PUCT. 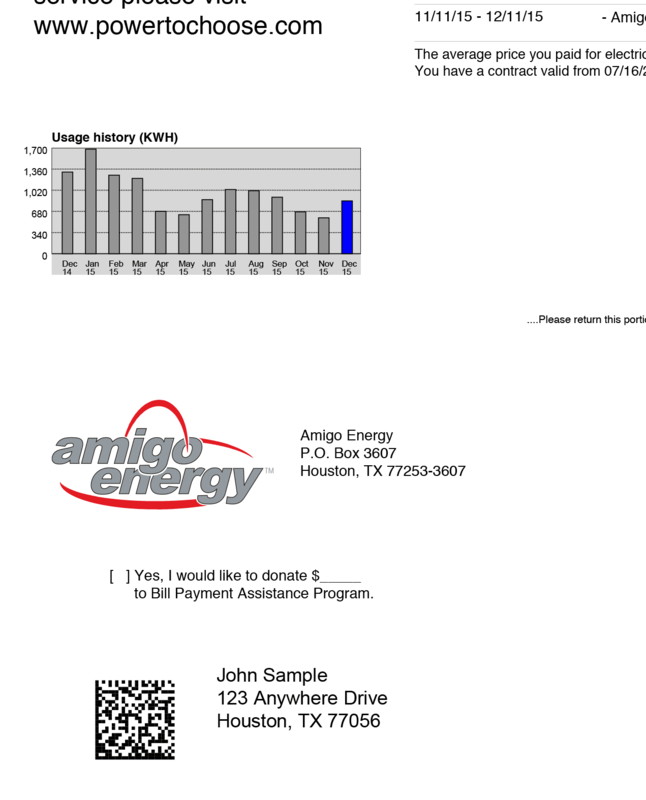 An internal code used by Amigo Energy to process your payments.